Aside from the creepy seer, let’s just talk for a minute about Floki (Gustaf Skarsgard) picking up what appears to be Ragnar’s crown. Maybe he’s just holding it for his friend? A lot of the success of Vikings has to do with the incredible cast that brings these characters, most of whom are based on historical figures, to life. Each day on set they put on their hand sewn costumes, put in their hair extensions and they go to work. “It just feels like we’re home and it feels like everybody wants to do the best that they possibly can,” said Katheryn Winnick, who plays the shield maiden, Lagertha. Several new cast members are coming on board to the Vikings family. Lothaire Bluteau as Emperor Charles of France; Kevin Durand as the mysterious man known only as The Wanderer; Morgane Polanski as Princess Gisla, the daughter and most trusted advisor of Emperor Charles; and Ben Robson as Kalf, Lagertha’s second in command. Season 3 of Vikings is slated for 2015 and will feature ten episodes. 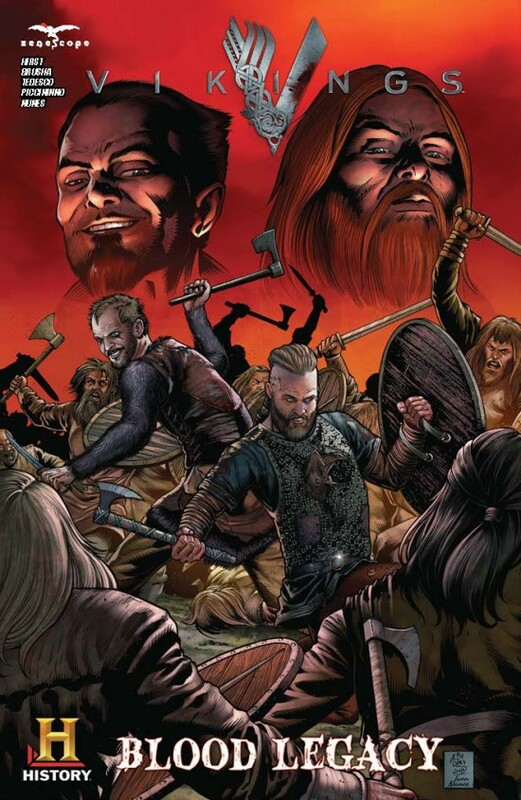 Last week during Comic-Con, select fans received the limited edition Vikings comic book which features Floki spinning a story about the Norse gods Thor and Loki. Check out the cover below.